The key to any successful adaptation can probably be summed up in three words: good source material. Of course, great material only increases your chances of success. Having had a hand in creating the stage adaptation of Rodgers and Hammerstein's only movie musical, STATE FAIR, I was delighted to have been asked to work on CINDERELLA, their only musical written for television, and a great one. Rodgers & Hammerstein's CINDERELLA premiered on CBS on March 31, 1957, the fourteenth anniversary of the team's arrival on Broadway with OKLAHOMA! The live telecast starred the new Broadway sensation, Julie Andrews, and pulled in an astounding audience of over 107,000,000 viewers. In 1965 the musical was remade for television, this time starring Lesley Ann Warren. It was this version that my generation grew up watching in annual telecasts through 1974. In 1997, CINDERELLA returned as a dazzling television spectacular on ""The Wonderful World of Disney."" With Whitney Houston serving as co-producer and Fairy Godmother, this all-star version also featured pop sensation Brandy in the title role, joined by Whoopi Goldberg, Bernadette Peters and Jason Alexander. Forty years after its premiere, the musical had lost none of its magical powers to enchant. There are some obvious differences between writing for the screen and the stage. In film, you show the audience as much as you can. In theater, you tell the story with words, and if you're lucky, music. On a screen you can control the audiences focus, showing them what you want them to see at any given moment. On a stage there are no close-ups or zooms or pans "" intimacy, suspense and comedy have to be in the material. As they say, ""If it ain't on the page, it ain't on the stage."" The theater was Rodgers and Hammerstein's home turf and it is not surprising that they approached CINDERELLA as if writing a Broadway show. So in terms of source material, Rodgers and Hammerstein's CINDERELLA is a rare charmer -- a musical written for the (small) screen that has enough genuine theatricality for a (big) stage. And its score ranks with the very best in the R&H canon: the soaring romance of ""Ten Minutes Ago,"" one of Rodgers' finest waltzes; the haughty and hilarious ""Stepsisters' Lament"" (based on Rodgers' Tchaikovsky-like ""Cinderella March""); the wistful optimism of ""In My Own Little Corner""; the sumptuous duet for youthful hearts, ""Do I Love You Because You're Beautiful? ""; the slyly ironic ""When You're Driving Through the Moonlight."" Ten songs in all, each one a gem. Actually, ten songs is rather a lot for a screen musical. (There were only six songs in the movie of STATE FAIR). This meant that the need to fill out the score of CINDERELLA was minimal. The most recent TV production augmented the score with two songs that neatly bookend the story and they are the only songs interpolated into our new adaptation. 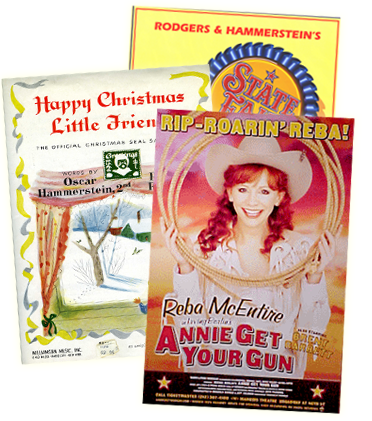 The first is ""The Sweetest Sounds"" from NO STRINGS, the only stage musical for which Rodgers served as his own lyricist. It is a luminous, haunting song of yearning (""The sweetest sounds I'll ever hear are still inside my head"") and anticipation (""And the dearest love in all the world is waiting somewhere for me""). It reveals a shared longing between Cinderella and the Prince even before they have met. The challenge of telling a story to an audience who knows exactly what is going to happen lies in how you tell that story. Hammerstein's original dialogue cleverly melded traditional fairy tale formality with modern vernacular (""He is more than a prince, he's an ace!""). He created his own kingdom where ""Once upon a time"" could have been last week, which made the story fresh and funny in a new way. The recent TV production seized the opportunity to update that device. A multi-ethnic rainbow cast lent the production a distinctly contemporary sensibility. Coupled with the skillful and witty use of idiomatic argot (""You got a problem with that? ""), the story once again emerged fresh, both timely and timeless. Cinderella first appeared in print in China during the ninth century and has since made herself equally at home in literature, ballet, opera, art, movies, and television; for a girl over 1,300 years old, she certainly doesn't show any signs of slowing down. Now, in a new century with new generations to enthrall, she may once again be found in her own little corner, in her own little chair, in the kind of home Rodgers and Hammerstein clearly loved best -- a live theater. An all-new stage production of Rodgers & Hammerstein's CINDERELLA starring Eartha Kitt as The Fairy Godmother will begin its U.S. National Tour in November.